As units, chairs and college fiscal officers identify personnel in workflow approval roles, it is important to make sure that proper internal controls over transaction processing and reconciliation are established. Below is information outlining what to consider when the eDoc Initiator is also the Fiscal Officer or Delegate on a transaction. If the eDoc Initiator is also the Fiscal Officer(FO) = Appropriate internal controls would be that a different person needs to reconcile/review the account and not the FO. If the eDoc Initiator is also the Delegate = Appropriate internal controls would be that a different person needs to reconcile/review account transactions and not the Delegate. Additionally, the FO could turn on their email notifications so they are advised when an eDoc is created on their account. When a Delegate approves eDocs, the eDocs will not show up in the FO’s action list or outbox. In addition to the FO receiving email notifications, the FO can also do KFS doc searches by the initiator’s ID to find eDocs or can also view the transactions in eData. There is a report in eData for department administrators to use to review internal controls. 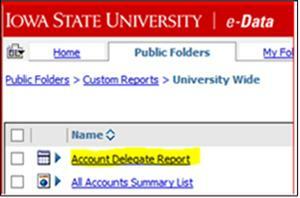 It is located in the eData Custom Reports folder>University Wide>Account Delegate Report. The Account Delegate Report gives the option to select the data by specific Org Department. Below is an example of the Account Delegate Report Showing each account's FO and delegate. Changes to the FOs can be made on the Main Menu tab of KFS under Account, enter either the account number to be changed or the FO to be changed and then select the appropriate account to edit. Please use this format for the description box “ACCOUNT NUMBER CHANGE FISCAL OFFICER” (ex 7011205 CHANGE FISCAL OFFICER) This will make it easier to identify changes to specific accounts when performing a doc search. Similarly, changes to Delegates can also be made on the Main Menu tab of KFS under Account Delegate. Instructions for adding or removing delegates can be found at KFS Creating and Editing an Account Delgate. If you have any questions, please contact Lana Jarvis in the Controller’s Department. Copyright © 2014, Iowa State University of Science and Technology. All rights reserved.